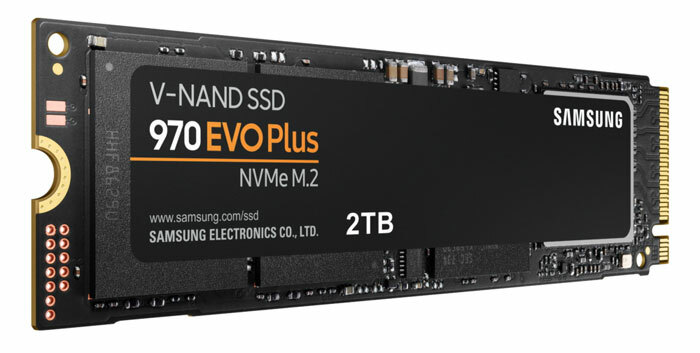 Samsung has updated its 970 EVO NVMe SSD range with devices packing its latest fifth-generation V-NAND technology. The result is a higher performance and more power efficient range of devices and Samsung will be keeping the keen EVO prices too, as it perhaps readies an update to the 970 Pro range. In claims made in an official press release, the newer V-NAND and optimised firmware in the Samsung 970 EVO Plus is said to deliver up to 57 per cent write speed improvements and greater power efficiency over its predecessor, the 970 EVO. Dr. Mike Mang, VP of Brand Product Marketing at Samsung said that this would be of great appeal to those indulging in "demanding tasks like 4K content editing, 3D modelling and simulation as well as heavy gaming". 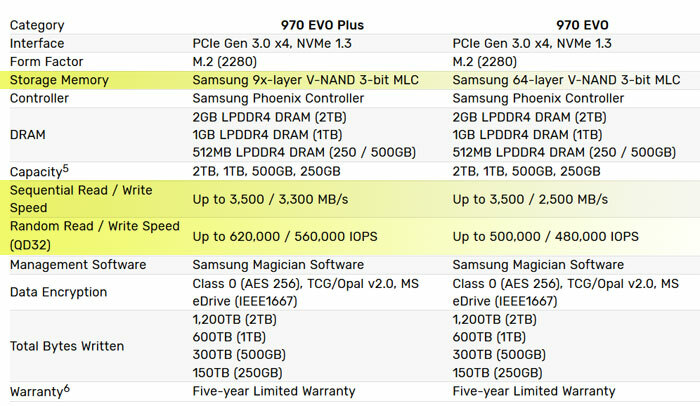 Comparing the new 970 EVO Plus with its predecessor is made very easy thanks to Samsung's own table, reproduced below. I've highlighted the changes to make it even easier to see the spec and performance upgrades delivered. Of particular note are the increased sequential write speeds and IOPS performance uplifts. Interestingly, the Sequential Read / Write Speed 3,500 / 3,300MB/s of the new Samsung 970 EVO Plus is even better than the existing 970 EVO Pro range which offers up to 3,500 / 2,700MB/s. One must expect a Pro series update to arrive to keep it ahead of the consumer EVO offerings. Samsung says that these compact M.2 form factor PCIe Gen3 x4 interface SSDs are now available in 250GB, 500GB and 1TB capacities, with the 2TB version scheduled for an April release. MSRPs start at $89.99. One to get as the boot device. Just as I was looking at the MP510, SN750, well guess that was short lived. So, the only improvement is write speed by 800MB/s. Phew, my 970 EVO NVME isn't obsolete yet. Faster IO speeds as well as much improved write speeds. Nice on paper but unlikely to have a noticeable real-world effect unless you hit them hard, in which case you'd likely have bought the PRO so it's a moot point. so if you had to buy a 970 evo next week which one would you go for ?